Jerky is a snack made from dried, seasoned meat. You can use just about any type of meat for jerky, from beef to pork to salmon. A food dehydrator is a handy tool for creating jerky. Dehydrators heat food gently and slowly at a low temperature to gradually draw the moisture out. As of April 2006, the U.S. Department of Agriculture recommends that meat be pre-cooked in an oven prior to dehydrating to ensure that dangerous bacteria are killed. Meat is marinated, seasoned, briefly oven-baked then dehydrated for a tasty, chewy snack. Slice the meat into thin slices about 1/4-inch thick and 6 inches long. Prepare your marinade according to the recipe. Jerky marinades tend to include an acid such as vinegar, a sweetener such as brown sugar and a salty element such as soy sauce. Experiment with recipes to find a flavor that fits your taste. Dip each thin slice of meat into the marinade then place the slices into your glass dish. Arrange the slices in a single layer in the dish then pour the remaining marinade over the meat. Cover the marinade dish with plastic wrap and refrigerate it for 8 to 12 hours or overnight. Remove the meat from the marinade and pat each slice dry using a paper towel. Season the meat by sprinkling salt, pepper and garlic powder over both sides of each slice. Heat your oven to 160 degrees Fahrenheit. Arrange your meat slices in a single layer on the baking sheet and place them into the hot oven. Heat the meat until a thermometer inserted into a slice reads 160 degrees Fahrenheit for beef and pork or 165 degrees Fahrenheit for chicken. This ensures that all of the potentially dangerous bacteria are killed. Remove the meat from the oven. Arrange the meat slices on the dehydrator trays using your tongs. Arrange them in a single layer. Heat the dehydrator to a temperature of 140 degrees Fahrenheit. Dry the meat at a constant temperature of 140 degrees Fahrenheit for 4 to 12 hours. The drying time will vary based on the type of meat and size of your cuts. Check to see if the jerky is done by bending it. The jerky should crack and bend, but not break. Remove the jerky when it is done. Allow the jerky to cool before placing it into your storage containers. 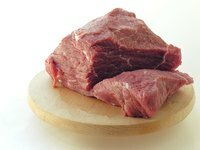 Freeze your meat in order to cut thin slices more easily. Archers Friend: No Need to Buy Expensive Jerky, Make It!